It is five years and more since Forbes Gibbes’ Lomax Press gave us wonderful new editions of two of R T Campbell’s rare detective stories from the 1940s (Take Thee A Sharp Knife and The Death Cap), but now Dover, who have had two Campbell’s in print since the 1980s (Bodies in a Bookshop and Unholy Dying), have brought out another, with an introduction by Peter Main. “R.T. Campbell” was the bohemian poet Ruthven Todd, a friend of Julian Symons and Cecil Day Lewis – neither of them mean crime authors themselves – who, as so many of the writers of the time seemed to need - money to allow him to do the things that interested him, (he was a specialist in the illustrated works of William Blake). Presumably he also knew Dylan Thomas as he slips in Thomas’s mock Welsh place-name “Llareggub” years before Thomas used it in Under Milk Wood (read it backwards). As Peter Main tells us, in a short period he wrote up to twelve crime novels, of which eight were published. If you like the farceur style of Edmund Crispin or Carter Dickson, with a detective who is larger than life, has strange speech mannerisms, and disregard for everything but himself then you will like Campbell’s Professor John Stubbs. 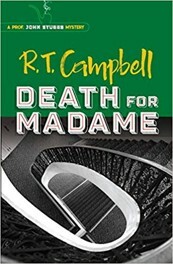 According to Peter Main Death For Madame was inspired by Campbell’s knowing Rosa Lewis in her later years. Lewis had been a demi-mondaine of the Edwardian period who later opened a London hotel that hosted anyone who was anyone. She inspired the BBC TV series Duchess of Duke Street. Lottie Rattigan is now a grotesque overweight parody of herself, and her run-down hotel in Notting Hill appears even more derelict as it is surrounded by V2 rocket damage, but she won’t be around for very long. Within twelve hours of having been introduced to Professor Stubbs, in the rocking chair in which she surveils the entrance to her hotel, she is found strangled with the cord from a table lamp. Madame’s presence has meant that the hotel doors need never be locked, but the police and Stubbs quickly identify all the suspects as firstly, all the residents of the hotel, and secondly, everyone who has anything to gain from Madame’s will. The names of the first group are the same as the second group. Who do we have in the hotel? A couple of nephews, at least one with a criminal record and considerable debts, another with considerable debts, several wretchedly elderly servants and companions, at least one young lady of perfect appearance but dubious morals. We are living in strange times as Madame dies, and one can see morals starting to change. An unmarried couple disclose they spent the night together, then they reveal that they found time to peer out of their bedroom door and saw another resident in the corridor only to discover that Stubbs finds the lady too pulchritudinous to believe that anyone would break off their love-making to open a bedroom door at such a time. If Lottie Rattigan was inspired by Rosa Lewis then another piece of reality enters the story: the villainous pair cannot have been in the hotel at the time of the murder as Stubbs realises, they were robbing a taxi driver. This is a recollection of the war-time Cleft Chin Murder, the subject of George Orwell’s essay “Decline of the English Murder”, in which a petty theft turned to murder. Campbell, partly to maintain the farceur atmosphere, keeps it a robbery, and instead uses it later in the story to increase the emotional intensity, as the consequences become more serious. Ultimately, although there is only one murder, there are three deaths. Professor Stubbs’ study, the Scotland Yard office of Inspector Bishop, and the hotel lobby – there are scarcely any locations bar these, and some readers may find them stifling. If anything, those rooms represent the attitudes that were coming to an end, though they would last another twenty years at least. The secret of the murder, though, the ties of love, still runs unhappily through life today.